Maybe it's just the excitement of an official first look at Captain Marvel in-costume, or that we're all waiting to find out what happens to our favorite superheroes in Avengers: Endgame, but whatever the reason, now feels like an excellent time to be reading some Marvel comics. And lucky you, Amazon is having a massive sale on just that. Bear in mind these are digital comics, not printed copies, and you'll need to read it via a Kindle device, Kindle cloud reader, or the Kindle app (available on iOS and Android). But, this is still a fantastic selection, especially if you want to get an idea of where the MCU might be headed or just see what other adventures the likes of Iron Man, Black Panther, Spider-Man, and the rest get up to when they're not dominating the box office. 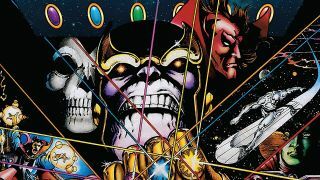 Infinity Gauntlet was a major source of inspiration for Avengers: Infinity War, and likely Avengers 4 as well. If you want to see how the Marvel universe responded to Thanos and the Infinity Gems (yes, they're gems in the comics, stones in the movies) before, check it out. Captain Marvel (2014) will introduce you to the most recent incarnation of the character. Though there have been other Captain Marvel stories in the past, this is likely to be the closest analogue to what the Captain Marvel movie will portray in 2019. Venom: Lethal Protector is said to be a major source of inspiration for the upcoming Venom movie, and it is so deliciously '90s. If you're a fan of this edgy anti-hero and haven't already read this tale, you owe it to yourself to pick it up. If you're more of a Star Wars fan, I highly recommend Star Wars: Darth Vader (2015). Taking place between Revenge of the Sith and A New Hope, this series digs deep into the Sith Lord's lore and backstory, introducing several characters which even got their own spin-offs. Just make sure you go for the 2015 series. The 2017 run has not been, in my humble opinion, nearly as good. Got others to recommend? Let us know in the comments! If that isn't enough Marvel-ous goodness for you, why not check out every new Marvel movie coming soon, as well as our ranking of the best Marvel movies.